The Volvo V70, XC70 and S80 have all been improved, with enhanced D5 and D3 engines, as well as the addition of 1.6 DRIVe variants of the V70 and S80. 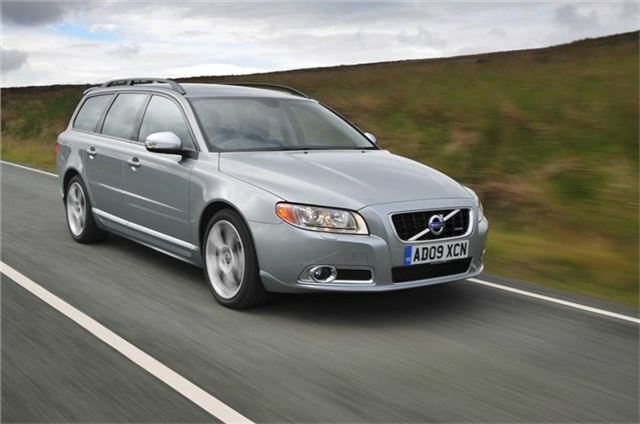 The updated models are available now, with the V70 starting at £25,995, the S80 at £25,245, and the XC70 at £28,815. Volvo's 2.4-litre twin-turbo D5 engine has been reworked, and now produces 215bhp, up from 205bhp, and more torque, 440Nm up from 420Nm. Despite the improved performance, fuel economy has been improved by 8%. The improved D5 powerplant gives the start/stop equipped manual S80 fuel economy of 57.7mpg on the combined cycle, with CO2 emissions of 129g/km. The auto manages 47mpg and 158g/km of CO2. D5 equipped manual V70s manage 55mpg and 134g/km, and the manual XC70 delivers 50mpg and 149g/km. The 2.0 turbo D3 engine, which is fundamentally the same as the D5 engine but with a shorter stroke, has also been improved, with optimisations to the turbocharger designed to improve driveability. The efficient 1.6-litre DRIVe engine is now available in the V70 and S80, resulting in fuel consumption figures if 62.8mpg and emissions of 119g/km for both. Besides the efficient engine, DRIVe models benefit from low rolling resistance tyres, brake energy regeneration and start/stop technology. Additionally, the S80, V70 and XC70 have been given a substantial spec overhaul, with a variety of new features on each model. All three now feature the Volvo Sensus infotainment system, which is presented through a colour screen in the centre stack, containting options and displays for audio, sat nav, reversing cameras, safety equipment and car settings. City Safety is now a standard feature on all three models. It aids the driver in braking, reducing or in some cases entirely preventing, collisions with the car in front. Pedestrian detection, collision warning and adaptive cruise control are other optional safety features now available in S80, V70 and XC70. There are also redesigned headlamps and door mirror mounted LED indicators, as well as a selection of new exterior colours and interior highlight colours, new wheel designs and finally, improved interior lighting.